I think many of us can relate to having one too many glasses of wine. For me, it’s usually a pounding heading headache that let’s me know I’ve overindulged. This cake is made with my go to vanilla layer cake recipe, and the “red wine” is made using my colorful white chocolate drip recipe. My main tip for this cake is to use a large, light- weight wine glass, to ensure that the frosting can hold it in place. I found these epic wine glasses at CB2 for $5, but most home goods stores sell relatively inexpensive individual wine glasses too. Begin by preparing the white chocolate ganache, as it will need to cool down before it can be drizzled on the cake. Heat heavy cream in a heat-proof bowl in the microwave for 45 seconds-1 minute, until bubbling. Gently pour white chocolate chips into the heavy cream, making sure they are fully covered with cream. Allow mixture to sit for 2 minutes. Stir slowly until mixture is fully incorporated, then add in a few drops of gel food coloring. Stir until fully combined. Then add A SINGLE tiny drop of black food coloring, to make a deep red. Be VERY CAREFUL with this step, as one extra drop of black will ruin the color or the ganache! Remember that you can always add more, but you can’t go back once you’ve added coloring!! Allow the ganache to cool until desired viscosity is reached. If there are still some bits of chocolate that aren’t melted, you can pour the ganache through a sieve to remove them from the mixture. If it seems to thin or thick, you can add a touch more chocolate chips or heavy cream! The type of cream and white chocolate that you use can affect the consistency, so feel free to adjust as needed. I like to put my ganache into plastic squirt bottles when decorating cakes! But you can also use a spoon to drizzle it over cakes. Leave ganache out to cool to room temperature. Next, begin to make the cake batter. Grease and line four 7” round pans. Mix together all dry ingredients (flour, baking powder, sugar, and salt) in a stand mixer with a paddle until fully combined. Mix chunks of butter slowly into the dry mix on a low speed. Continue to mix until no chunks of butter remain, and the mixture becomes crumbly. In a separate bowl, combine all wet ingredients (vanilla extract, egg whites, buttermilk, and vegetable oil), and whisk to combine. On low speed, add 1/3 of the liquid ingredients to the dry/butter mixture. Mix until fully incorporated, scraping down the sides of the bowl as needed. Mix in the remaining wet ingredients in two installments, on a medium-high speed until fully incorporated. Divide the batter in half, and color half of it red, with gel food coloring. Then alternate scoops of white and red cake batter, until all four pans are filled. Take a butter knife, and run it through the pans to swirl together the colors. Bake for 35 minutes, or until a skewer comes out clean. Allow to cool for 10 minutes, then run an offset spatula around perimeter of the pan to separate the cake from the pan. Place cake layers on a rack to finish cooling. While the cakes bake and cool, prepare the vanilla buttercream frosting (click here for tutorial). Whip the butter until it is light and creamy, then slowly add the powdered sugar. Alternate installments of powdered sugar with heavy cream, and continue mixing until the frosting has reached desired consistency. Add salt and vanilla, and continue mixing until fully incorporated. Assembly the cake layers, apply and even layer of buttercream between each layer. Apply a crumb coat, and place the cake in fridge for 20 minutes to allow the frosting to cool and firm. Then apply another layer for frosting, and smooth with a cake bench. Create a mountain of frosting on the cake with additional frosting, and firmly press glass into the base of the frosting mound. Smooth frosting into the glass, to make it look like the glass is full of red wine that is spilling out. Pour ganache over the cake, and using an offset spatula, spread some on top of the frosting in the glass. Allow some of the ganache to drizzle over the sides of the cake. Hi there, I was wondering if the recipe of the wine cake can be halved? And if it can be halved- what size baking tin do you think is needed? Yes, it can be! I’d use six inch baking pans!! Chelsweets…I am looking for the cannoli cake featured in the beginning of the video …any help on finding it would be greatly appreciated!! Thanks a bunch! How would you suggest transporting a cake like this? since it’s glass, you need to be extremely careful!! I’d assemble it onsite if possible!! Wonderful cake! I chilled it in the fridge before driving across town, not a problem with the glass moving. happy to hear that 🙂 yah if it’s chilled it should keep in place pretty well! Made this cake yesterday for someone’s birthday…it was a hit. Cake was really good. Any way to make this cake in chocolate? Thinking maybe reduce the flour by a cup and add cocoa and a little strong coffee. Any suggestions? Thank you for the great recipe!! Did your glass stay put? Did you assemble on site?? Yes I didn’t have to transport this cake! However, if you’re pushing the glass into the top layer of frosting/cake, it should definitely stay in place! Hi! I want to make his for a birthday but would have to assemble it the day before and keep it in the fridge until the morning. Do yo I think the wine glass will be ok on the cake for so long? Hi – A few questions. 1) It says 4 sticks of butter for the frosting. Is that 4 – 1/4 cup sticks or 4 – 1/2 cup sticks? 2) Do you think I can make the buttercream frosting the night before and then take out a few hours before frosting? And 3) Is this a double recipe? I always feel like I run out of frosting. Thank you! How do you keep it food safe? ( is that plastic or glass wine glass?) and what if I wanted to put a glass wine bottle or beer can into the cake? Do you need to do anything to keep it food safe? I just made this cake for a friend’s birthday, so I’m not quite sure! If you are worried about using glass, you can definitely use a plastic cup! I’ve never placed a bottle or can into a cake, so i’m not sure. What food coloring brand and number do you use? I use americolor! There aren’t numbers for that brand, but this is just using a true red with a tiny drop of black! I made this cake for my daughter’s birthday & although it was cute the cake was nasty. It was a real disappointment – we had to throw the cake out. sorry to hear that! what was wrong with it? I’ve never anyone say that about this recipe before. Maybe something went wrong? I don’t have a 7″ pan but I do have a 6″ and an 8″…how can I make this work without having to buy extra pans? Thanks! You can use either! This recipe makes 4 8 inch layers as well, they’ll just be a it thinner than the 7 inch layers and bake for 35 mins! 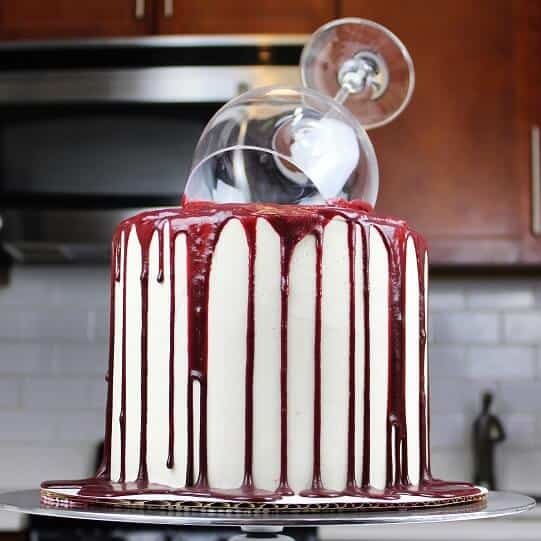 Do you think a whipped cream frosting would work well in place of the buttercream, or do you think it wouldn’t firm up as well for the support of the wine glass? Sadly I don’t think it would! If you press the cake into the actual cake layer, there’s a chance it might stay in place, but I’d be nervous!! Do you also have the recipe for the cannoli cake? Is it possible to replace the food coloring with strawberry simple syrup to add color and make it a strawberry swirl? yes! I’d use freeze dried strawberries instead though! That way they won’t throw off the consistency of the batter, and impact a really great strawberry taste! Is it possible to change out the food coloring for strawberry simple syrup and make it a strawberry flavored swirl? I wanna induce real red wine in the cake how can I do that ? Thank you ? will be making this tomorrow! Would Super Red Americolor work for base of the wine color along with a touch of black? Definitely! That’s what I used! I watched the youtube clip and it seems the buttercream recipe was doubled for decorating? Is the recipe listed a single or double batch of icing? Also, I only have 9 inch rounds. Can I make 3 9 in rounds with this recipe? i usually use 1.5 batches of buttercream to decorate my cakes, but it varies based on how I’m decorating it. You can, but they’ll be thinner than my normal layers! Hi! I love the idea of this cake and I can’t wait to try it out! However I live in a small apartment and my freezer is not tall enough to put the cake in with the wine glass. Is it possible to put it in the fridge instead for but for a longer period of time? No worries! The cake was a hit!! Love using your classic vanilla layer cake as a base for all the cakes I decorate! Can the ganache be made a day ahead of time? If so, would refrigeration be recommended ? Pingback: Elle plante une coupe à vin dans le glaçage de son gâteau! Maintenant, regardez bien ce qu'elle fera! I have 9 inch cake pans will the recipe work for those or do I really need some smaller? You can use the same recipe to make two, nine inch cake layers!